Bring Christ back to Christmas by giving your children a devotional experience that adorns your tree with Christian symbols. This book offers 25 devotions for each day from December 1st to December 25th, Christmas Day... the day Christians celebrate that God's purpose wass finally revealed in the coming of the savior, Jesus Christ. Each devotion traces the heritage of Jesus through the stories and prophecies of the Old Testament. 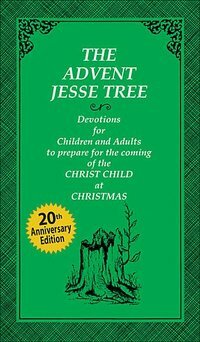 The Advent Jesse Tree enables individuals and families to engage in a more meaningful celebration of the Christmas season. Each devotional story is paired with a representative symbol that traces the heritage of Jesus...such as a lamb, a dove, a rainbow, a heart, a star, etc. Children and their parents can utilize the symbolic line art printed with each daily devotion to craft meaningful ornaments. These symbols coincide with the prayers, a memory verses, questions for children, and songs found in the devotions for that day. Finally, on Christmas day, your tree will be filled with reminders of 25 Bible stories that led up to Christ's birth.